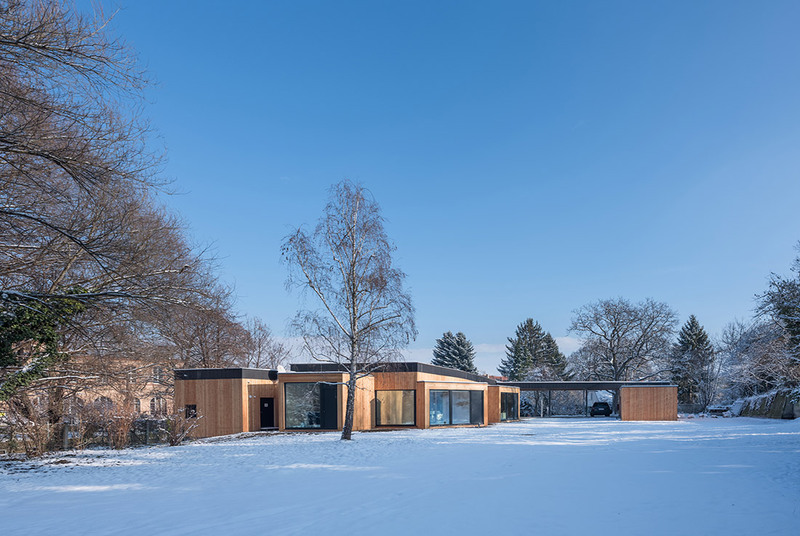 The newly built youth center ECHO by puerstl langmaier architekten replaces the old building on the Mühlgang and creates a sheltered place with a variety of development opportunities for young people. 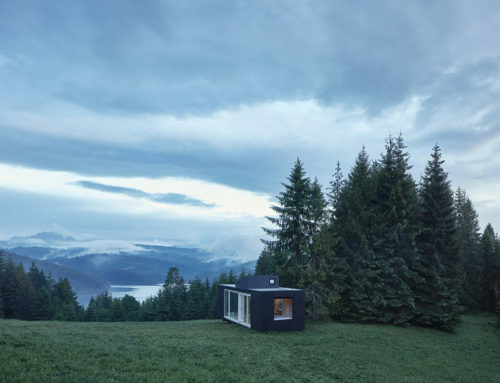 Surrounded by nature, this massive wooden building offers a safe and secure place to exchange both externally and internally. Youth centers are places of open youth work, provide space for encounter, the acquisition of social skills and educational content. The young people find inspiration and support and can use a wide range of meaningful recreational opportunities. 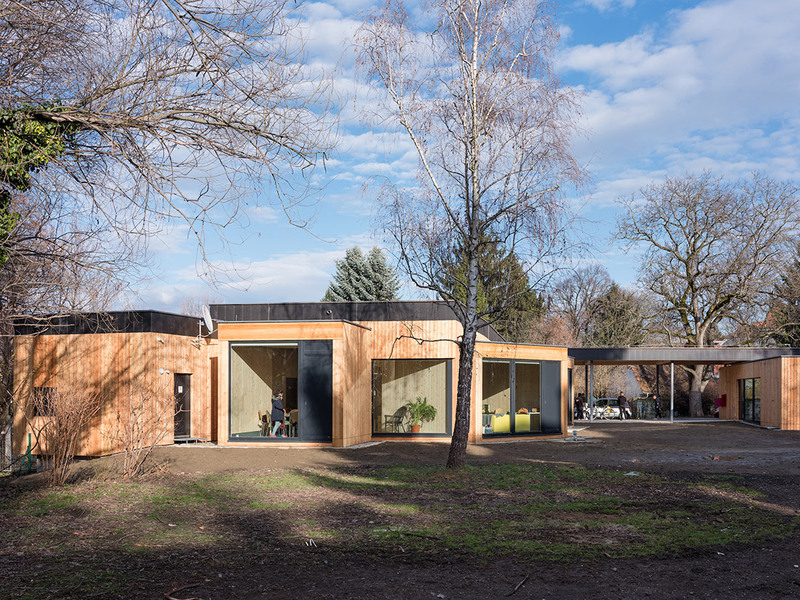 The youth center in Leuzenhofgasse near the Fröbelpark in Graz-Lend is embedded in an urban green oasis. For most graders this is an unknown urban area. The immediate environment consists of wooded green areas, a dog zone and the mill passage. In 2007 the ECHO replaced the youth center INSEL and continues to be operated by the association JUKUS. The target group are young people in the age group 12 to 19 years, the average age of the visitors is 16.3 years. 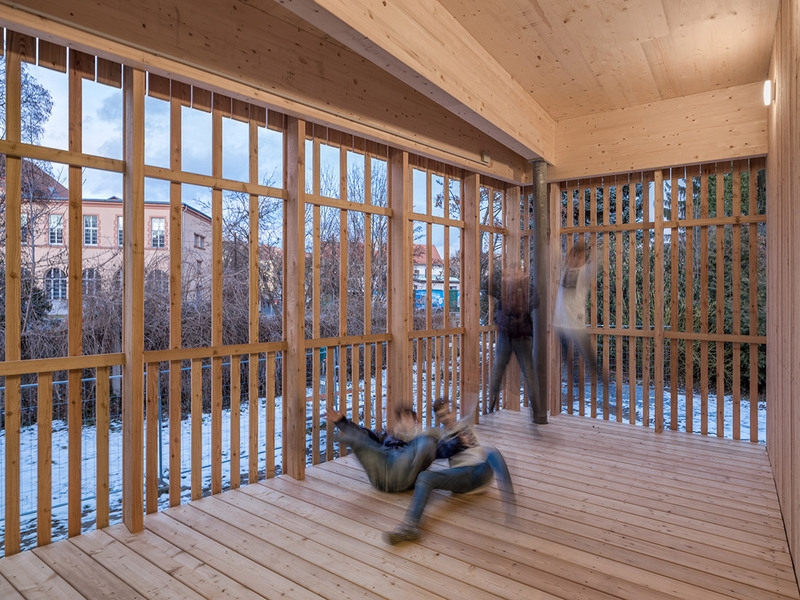 For the design of the youth center ECHO a invited competition of the city of Graz was held. The main requirements were the visibility of the indoor and outdoor areas and compliance with the budget of 550,000 euros. Instead of the old building that was unable to rehabilitate, which once served as a nursery garden, a timber construction was created, which suggests both the glass facades and the free zones in the south openness, as well as by the materiality, the immediate environment and spatial distribution security and protection. 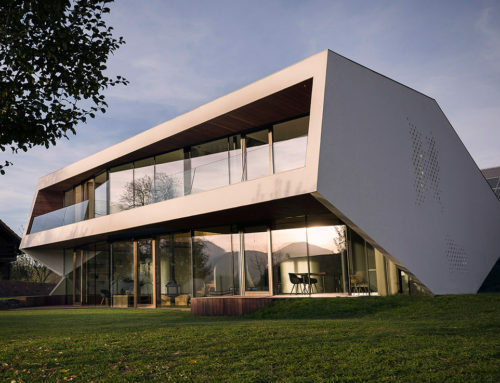 In view of these aspects, the design of the architects Bernd Pürstl and Herwig Langmaier also emphasized the orientation of the center. 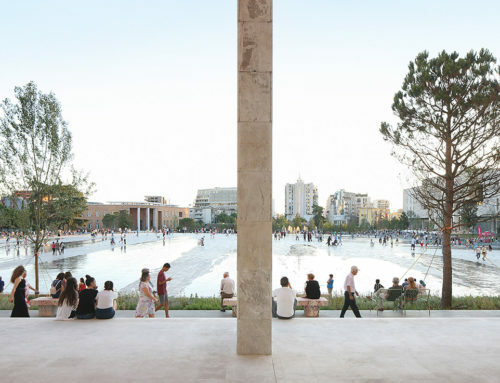 The main structure sits with its longitudinal orientation on the northern edge of the embankment, creating a generous outdoor area to the south. The site is rising strongly to the west and is covered with dense trees. On the part of town planning, a distance of ten meters to the Mühlgangverlauf was given, as there is a dog area. This resulted in the positioning on the eastern edge of the building site. In terms of planning, there are clearly defined areas with mutual relationships. The main focus is on the insight of the interior and exterior areas through the main room. Access is provided via a covered entrance area connecting the workshop and the main area. 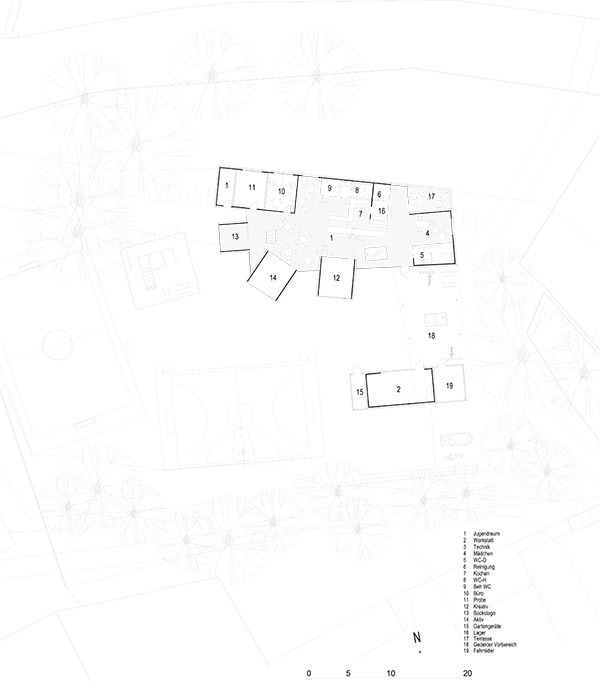 The building structure results in a court formation with main building, passage zone and workshop area. 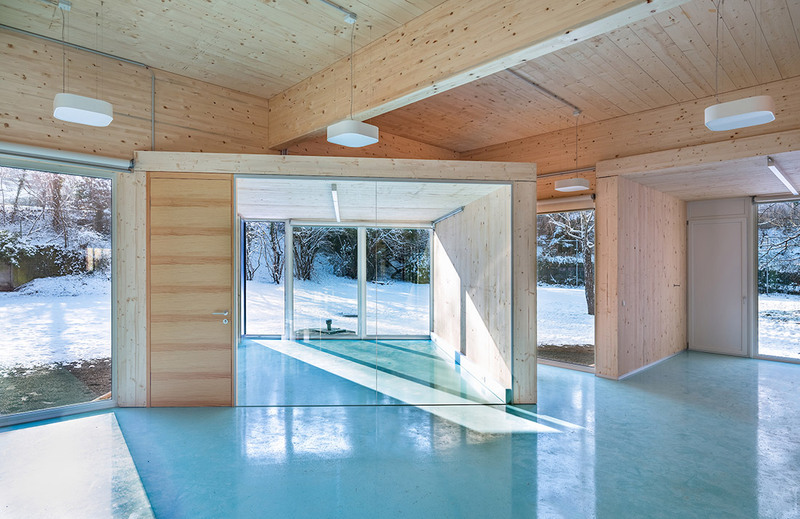 The side rooms are positioned on the Mühlgangseite and north side, including a large group room without traffic areas with central counter area and viewpoints to the outside and an active space and creative space. In order to include cultural aspects, a protected girl area was planned, which is now granted an open function due to the new target group. The main lounging area has well-organized retreats between the camp and sanitary zones, as well as between the creative-active boxes and the backstage area. The roof was raised in the main living area (cafe, function room) to get the desired room height. The Youth Center ECHO is a pure timber construction, consisting of BSP panels and glulam beams with steel columns on a reinforced concrete slab. 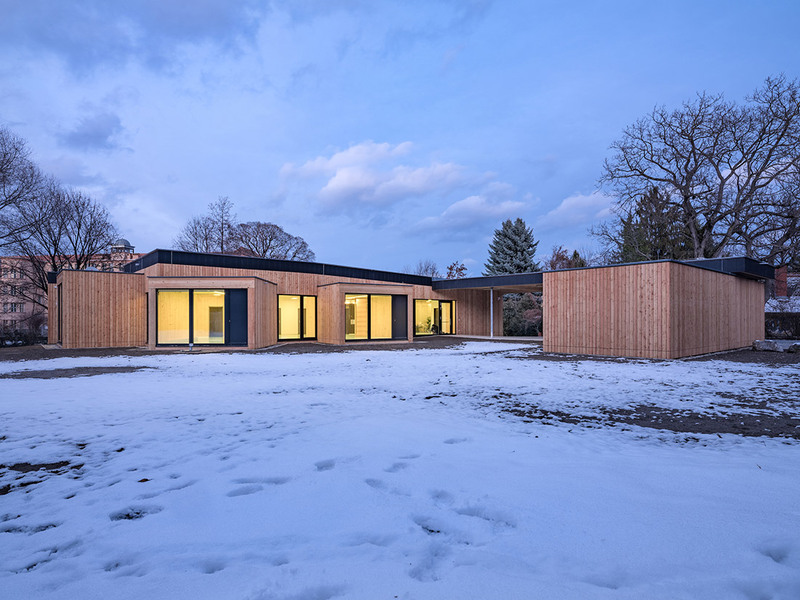 The building is thermally insulated with sawn larch formwork and an open joint. The edge of the roof was finished with Eternit roof tiles in black. Instead of the originally planned larch windows, plastic windows with aluminum mounting were installed, inside with industry-standard quality and visible e-installation.